This floral tapestry shows a work from "The Temple of Flora", a master collection of botanical paintings by artist Robert John Thornton, originally published in 1812. Filled with botanical detail, this work combines the precise science of the study of flowers with the art of a master painter. The sumptuous detail in the petals of the variegate tulips can be seen and reflects his work as a physician and botanical artist and writer. The tulips here are in a variety of colors and patterns, which are highly prized for their unique and very beautiful appearance, highly loved by the British as well as the Dutch over centuries. 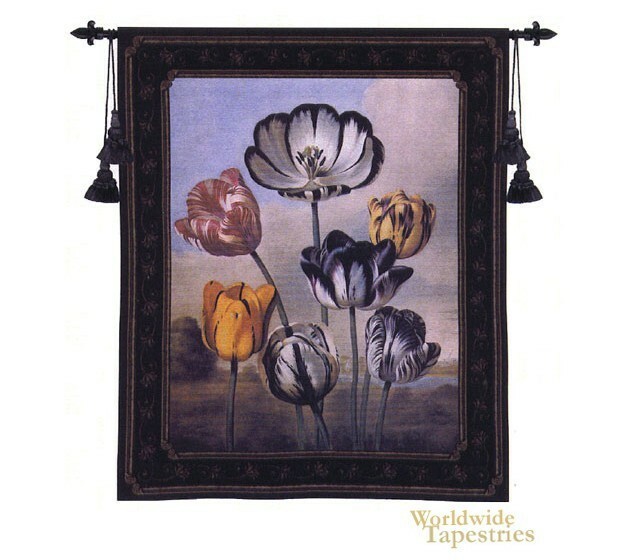 This floral tapestry "The Temple of Flora" is backed with a lining and has a tunnel for easy hanging. Note: tapestry rod and tassels, where pictured, are purchased separately.